Vedic Astrology is very different from Western Astrology. The Astrology developed in India was created by seers and sages who had intimate contact with the Divine. The ancient Vedic astrology predictions help you to be prepared for what life has in store for you. Your personalized 2019 predictions, as a one-year detailed report, can help you to know your life in 2019 and serve as a guide to your planetary positions in the upcoming year, helping you decide on remedial actions for the most successful year. Why Should I Get My 2019 One-Year Detailed Report? Prepare yourself for 2019. The science of Vedic Astrology can shed light on your experience of 2019 and the unknown times ahead. Your 2019 personalized predictions report will be calculated by our expert astrologers and presented in a clear and to-the-point format, which is easy to understand. It can reveal what opportunities or challenges face you due to the transitory movements of the planets and how this can influence core areas of your life in each quarter of 2019. Timing is fundamental in Vedic Astrology. The AstroVed Astrology Calendar for 2019 provides a simple and straightforward method for you to understand and use time in the most useful and meaningful way. The 2019 calendar is your year-long guide for all planetary transits, Moon phases, birthstar days and more. With the help of this calendar, you can easily refer to critical elements of time and manage your day better. The calendar is a wonderful gift for loved ones that can benefit them all through the year. Unveil what is in the cards for you in the upcoming 2019. This detailed analysis report offers you an expert insight into different aspects of your life – Money, Career, Romance and Relationship, Health, allowing you to take calculated and informed decisions. Your Personalized 2019 Horoscope Prediction report will be based on how your Dasa (major planetary period), Bhukti (minor planetary period) and planetary transits influence your life. Get all your questions answered in the report. 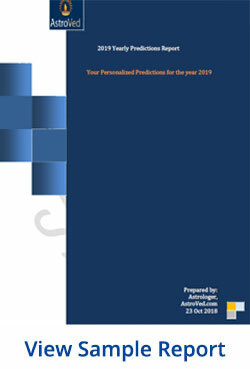 Order your personalized 2019 report now and receive AstroVed’s 2019 Calendar as a bonus.